For his second John Golden tale, Django Wexler adds another layer to his cyberpunk magical fantasy. 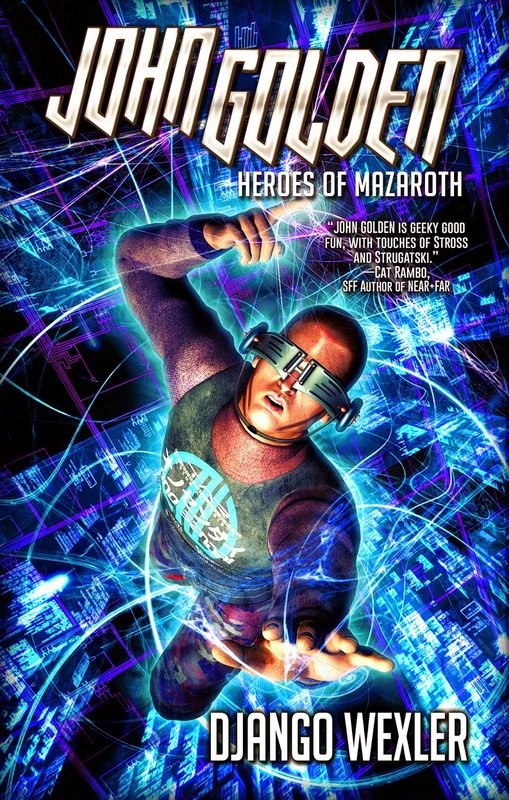 We already have a world in which fairies inhabit the internet, infecting networks with their magical burrows, but Heroes of Mazaroth kind of turns that mix on its head, with a fairy Dark Lord who has escaped a MMPORG, tired of beating off human players who only re-spawn a few hours later, to infect a company's intranet. This is a very strange sort of clash of cyberpunk and urban fantasy, with a noir detective style of narration, but it works. It's also a remarkably funny story, with much of the humour driven by John's assistant, trapped inside his laptop, who provides running commentary on his narration through footnotes. The Dark Lord feels like a Monty Python sort of character, a tired, bored, frustrated fairy who just wants to be left alone. He understands the tropes and the stereotypes, is entirely self-aware of how poorly his costume and his lair adhere to those standards, and gets entirely far too excited at the prospect of bigger spikes, darker leather, and volcano lairs full of blood. Watching John take his place in the game is fun, but it's when he encounters a human player who recognizes that he's more than just a re-spawned villain that the story gets really interesting. More short story than novella, Heroes of Mazaroth is a perfect length - long enough to satisfy, but not so long as to overstay the humour of its welcome. It also works perfectly fine as a standalone tale, so don't worry if you haven't read the first John Golden tale. Django Wexler graduated from Carnegie Mellon University in Pittsburgh with degrees in creative writing and computer science, and worked for the university in artificial intelligence research. Eventually he migrated to Microsoft in Seattle, where he now lives with two cats and a teetering mountain of books. He is the author of Roc's military 'flintlock fantasy' The Thousand Names and the middle-grade fantasy The Forbidden Library. When not writing, he wrangles computers, paints tiny soldiers, and plays games of all sorts. The world's most popular massively multiplayer online role-playing game. Tens of millions of players have stepped into the shoes of fighters and wizards, dwarves and koalamancers to battle the forces of evil. John Golden has been asked to extract a fairy from the computers of a finance company, where it's sitting on some vital data. Inside, he finds a depressed Dark Lord and a portal to a realm of fantasy. But when he steps through, he finds himself cast as the villain of the piece, with an army of adventurers ready to thwart his evil schemes. John hasn't *got* any evil schemes, but he realizes he'd better come up with some fast. Unless he can change the story, he'll be stuck in Mazaroth as a final boss...permanently. Loved this book! I play World of Warcraft so it was extra hilarious. I need to look this one up.